As with all vans you see on Instagram you have no idea what’s really under all the wood and panelling and our van is exactly the same. 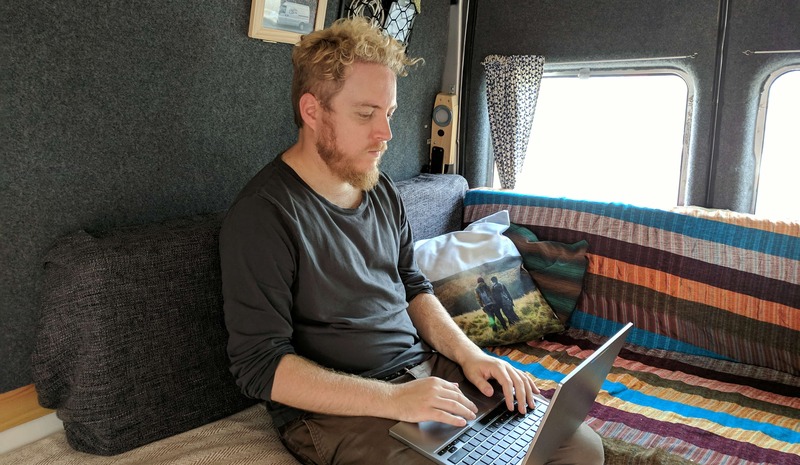 Based on the questions we get from you guys we thought we would pull back the curtain a little and talk you through what went on during our self build conversion from panel van to camper van. What lights do we have? We thought about lighting very early on in the process of converting our van. The main reason for this is that we wanted to make sure we wired the van before we began panelling it so that we could hide all of the wires behind this panelling. We also, however, wanted to ensure that the van was well lit because after all, this was going to be our home and the last thing we wanted was for there to be dark corners of the van or to be blinded by one large light. With that in mind, here are the lighting options we installed in our van. We initially began with 2 white light bars above the kitchen. We wanted white light where we were cooking because its an area where we wouldn’t be sitting and relaxing and one where we wanted the most illumination. This pack of light bars has independent switches on each bar so that we can have just one of them on if we need (such as in the morning when one of us is making coffee and the other is still asleep) and only cost around £15 for the 2 lights. For the living area we wanted a warmer light more akin to the ones we have at home as, afterall, this was going to be our home. So we we opted for 2 of these warm light bars which only cost around £5 per bar. Although they aren’t as bright as the kitchen lights we installed they throw a much nicer and more comfortable glow across the van and light the living area well. As we have mentioned throughout our website, we are both avid readers and so one thing we knew we wanted was night lights for us to be able to sit in bed and read. We opted for a pair of round down lighters which we recessed into the cabinet and wall by each side of the bed. They give a low warm glow which enables us to read while in bed and can also be used for a lower more stealth lighting in the van when we want to be less conspicuous. 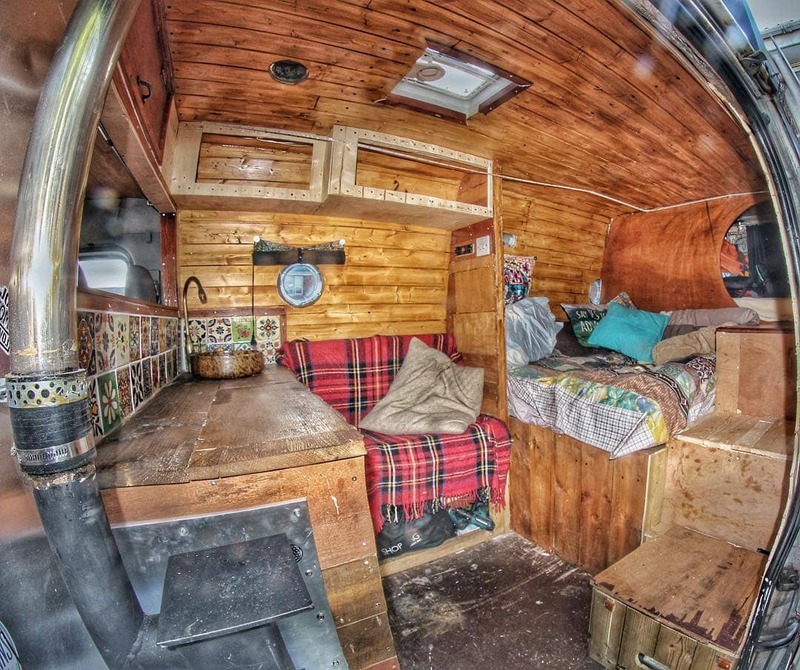 No van conversion would be complete without the obligatory fairy lights across the ceiling. We got some simple lights which run on USB which we then attached across our ceiling and plug into a USB port when we want some low romantic lighting. What outlets do we have? We wanted to make sure that we had access to sockets throughout our van and so we have 3 pairs of USB and cigarette lighter sockets spread throughout as well as an additional USB socket attached directly to the solar charge controller which only works when we are collecting solar power. Having this many outlets in such a small area may seem excessive but being able to plug so many devices in to charge and still being able to access them without having to navigate round someone else in the van makes life much easier. What is an inverter and why we don’t have one? When putting together your van electric system you will most likely be creating a 12V system, this is the same voltage that your car or van will use for their electrics. However the majority of your plugs will be the 3 pronged ones you use in your house when you’re on mains electricity which in fact run on 240V. This means that you are unable to use your plugs inside your van because the voltage simply isn’t strong enough, this is where an inverter comes in. An inverter takes the 12V DC current that is being produced by your battery and steps it all the way up to 240V AC current which is what your chargers and plugs use in order to run your devices. Therefore if you install an inverter into your van you will be able to simply plug in your normal 3 pronged plugs and run your devices just as you would in your home. 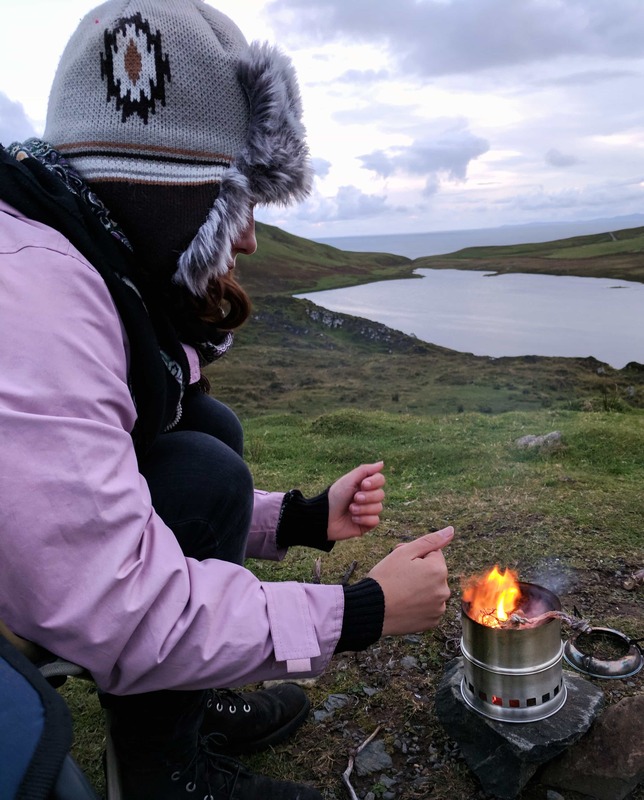 We don’t actually have an inverter in our van and the reason for that is that not only did we think we didn’t need one to be able to power our devices but it actually isn’t an efficient way for us to use our power. The first thing to know about the process of inverters is that it is not an efficient one. Whenever you step up the voltage you are losing some of the power to do so as the inverter itself requires power to work as well as the fact the process is not 100% efficient. When you’re on a limited supply of power wasting some just to change its voltage seems like a poor use of this limited resource. Not only is the process inefficient it is often not even necessary, take my laptop for example. My laptop has a 240V plug just like everyone elses however half way down the charging cable, between the plug and the USB-C port you will see a big brick, on there it has the information about the charger itself. On mine it states that the input for the charger is 240V which is what we’d expect, but then it states the output is 12V. So if I were to plug in my laptop charger to an inverter I would be taking our 12V power, stepping it up to 240V (with loses in power) only to step it down to 12V so my laptop could handle it. Seen as this is the case I can just cut out the middle man and plug my laptop straight into our 12V supply. Now for my laptop (a Chromebook Pixel) that simply meant using a USB to USB-C cable which I had plenty of anyway however we found that all laptops had charging cables available for cars which means you can plug them straight into a cigarette lighter socket which we have as part of our outlets. This meant Olivia was able to inexpensively charge her Macbook just by using a 12V cable. We found this was the case with every device and charger we used, phones plugged straight into the USB, Kindles the same and we even got 12V chargers for all our camera batteries. It was much more efficient than using an inverter and saved us the cost of one and the power loss that comes with it. As we always state, we are by no means experts when it comes to converting van and each van is individual and your light and power needs are unique, we just hope that you find some of this information useful when converting your van into a rolling home. If you have any more in depth questions about our conversion don’t hesitate to contact us. 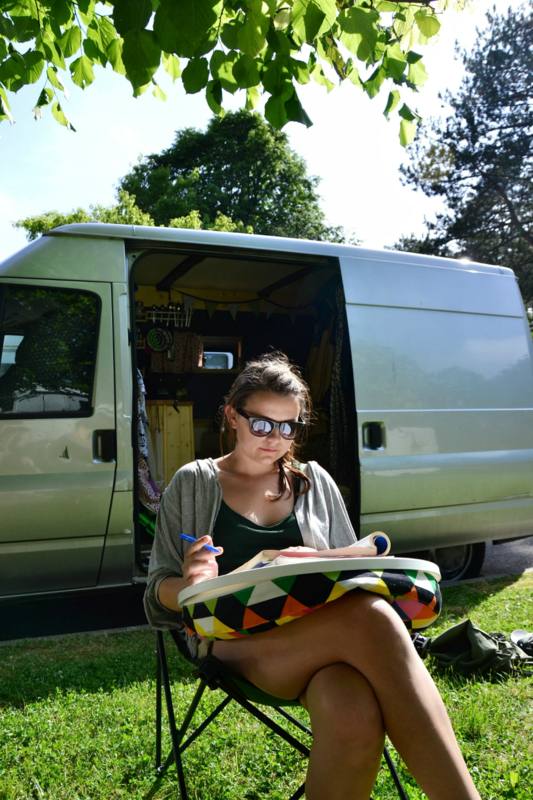 For further Van Tour reading why not have a look at our van tour page where we will be adding more in depth information about the specifics of our van!